The fast talking, emotionally riveting, and oddly hilarious Stefan Molyneux has been a favorite (mostly) libertarian talk-show personality of mine for years now. It is generally the case that the more libertarian a speaker is, the more "flat" he/she is as a speaker. Consider the near monotone of Lew Rockwell or the inexpressive intonation of Ron Paul. Tom Woods' vocal delivery is not quite as wooden, but note that he never loses his temper in many hundreds of hours of speech and debate (and also did not begin as a libertarian). Once we get to the more dynamic and emotional speakers, we notice pockets of non-libertarian ideology or bursts of non-logical behavior; I put Stefan Molyneux in this category along with Alex Jones, Adam Kokesh, and others. The degree of one's libertarianism (and coincidentally one's ability and tendency to disengage one's emotions from one's mental processes) is indicated in the natal horoscope, as are one's likely sociopolitical views in general. You may peruse this blog and associated web site for thousands of examples. So while the anti-mystical Molyneux may not believe in the validity of astrology, his horoscope nevertheless describes his personality in a way that no other personality-typing system can. Apollonian: Pallas opposite Mercury, quindecile Sun, and ruled by Mars which is septile Sun and square the Nodes. Dionysian: Pallas quincunx Pluto, squine Jupiter, and quincunx South Node. Apollo is slightly stronger than Dionysos on this one. On "The Axis of Good and Evil" this puts Molyneux between the "Libertarian" and "Statist" quadrants, but because the Nodes are involved the "wildcard" factor is high. Capitalist: Venus trine the North Node. Collectivist: Venus sextile Neptune; Second House ruler Neptune conjunct South Node. Mixed signature here, probably leaning Rightward economically. Conservative: North Node conjunct IC. Liberal: Venus rules IC and is sextile Neptune. Normally these mixed culture signatures lean to the "liberal" side, but the North Node on the IC is an extremely strong indicator for cultural conservatism (think Pat Buchanan and Vladimir Putin). Yes, he calls himself a libertarian and proclaims himself an anarcho-capitalist, and has given many wonderful discourses on the topic. But he also wholeheartedly supports Donald Trump and lambastes Islam where many of his fellow an-caps fall short or silent. Sun opposite Chiron/Saturn: struggle/injury resulting from absent parent? Venus conjunct Pluto in the Seventh House: Venus rules (young) women and the throat, and Pluto rules psychotherapy and cancer. Molyneux is married to a psychotherapist and recently recovered from throat cancer. You can't make this stuff up. Uranus is also conjunct these points, suggesting an element of unorthodoxy. In this case Molyneux is a stay-at-home father whose wife works outside the home. Jupiter at 29 Cancer in the Sixth House: He talks a lot about race and race-oriented public policy. 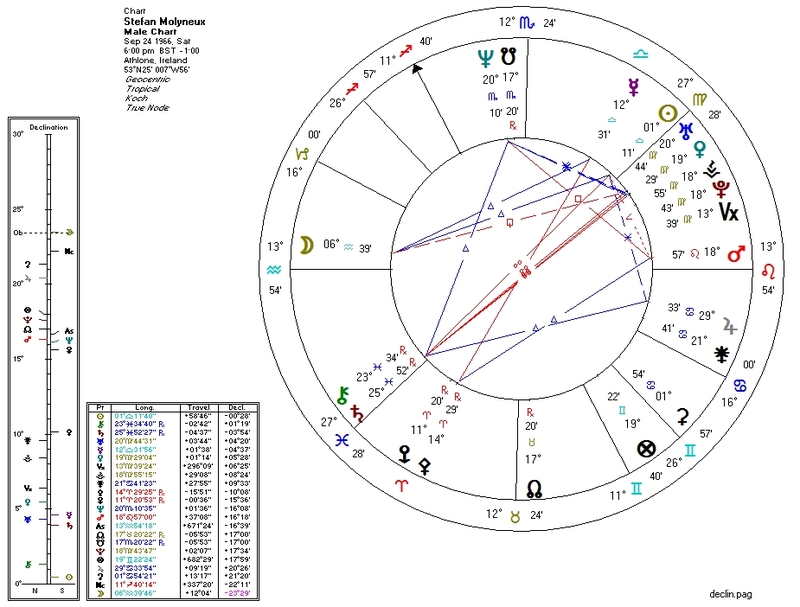 Grand Trine with Neptune in the Ninth, Saturn in the Second, and Jupiter in the Sixth: Molynuex combines popular illusions, economic policy, and racial issues in his work. Neptune conjunct South Node and trine Saturn: born to be atheist/anti-mystical (I've done some research on the charts of atheists and found patterns). Moon in the Twelfth: alienation/separation from his "family of origin". Unaspected Mercury (ignoring minor aspects, asteroids, etc. ): strikingly pronounced communication faculty, extremely difficult relationship with a sibling. Stefan Molyneux talks about turning 50 (he discloses his full birth data at the start).